"THE FEAST DAY of Aghios Demetrios is a great feast for all of Orthodoxy, but especially Thessalonica, which is his birthplace. His church is a building dating from the ancient Christian era, built one hundred years after his holy martyrdom which was in 296 A.D. But after 300 years it burned, and was rebuilt in the days of Leo the Wise." "St. Demetrios along with St. George are the two brave lads of Christianity. These two are below on earth, and the two Archangels Michael and Gabriel are above in heaven." "In ancient times there were painted without armor, but in later years they were depicted armored with swords and spears and dressed in metal breastplates. On one shoulder they have their helmet hanging, and on the other their shield. At the waist they are girded with the straps which hold the sheath of the sword and the quiver which has in the arrows and the bow. In recent years, after the conquest of Constantinople, these two saints, and many times other soldier satins also, are painted as riding horses, St. George on a white horse, St. Demetrios on a red one." "This armor which these Saints wear, depicts spiritual weapons, like those of which the holy Apostle Paul speaks saying, "Put on the armor of God, that you may be able to stand agains the wiles of the devil. For our wrestling is not against flesh and blood, but against the Princeipalities and the Powers, against the world rulers of this darkness, agains the spiritual forces of wickedness on high. Therefore tak up the armor of God that you may be able to resist in the evil day, adn stand in all things perfect. Stand, therefore, having girded your loins with truth, and having put on the breastplate of justice and having your feet shod with the readiness of the Gospel of peace, in all things taking up the shied of faith, with which you may be able to quench all the fiery darts of the most wicked one. And take uunto you the helmet of salvation and the sword of the spirit, that is, the word of God" (Eph.6:11-17). This heroic and perserving character, which the warriors have who were martyred for Christ like harmless and innocent sheep, has reference to spiritual things." 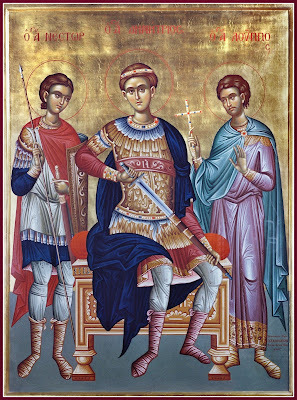 "AGHIOS DEMETRIOS, the Great Martyr and Myrovletes (myrrh-emitting), was born in Thessalonica in 260 A.D. His parents were illustrious people and along with the transitory glory which Demetrios had from his family, he was adorned with imperishable virtues, with prudence, with sweetness, with humility, with justice, and with every noble comeliness of the soul. All these were like precious stones which shone on the crown which he wore, and this crown was the faith in Christ." "In those days, there reigned in Rome Diocletian, and he had appointed as caesar in the parts of Macedonia and the East a hard-hearted and bloodthirsty general who was called Maximian, a beast in human form as were all those military rulers (polemarchs) who then ruled the world with the sword: Diocletian, Maxentius, Maximian, Galerius, Licinius -- hard headed, firce-faced, strong-jawed, grim-mouthed, with short thick necks like barrels, ruthless, and therrifying. He in turn appointed Demetrios ruler of Thessalonica and all Thesaalia. 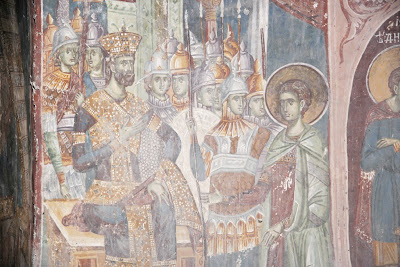 When Maximian returned from a certain war, he gathered the officers of Thessalonica in order to offer sacrifice to the idols. Then Demetrios revealed that he was a Christian, and did not accept hewn stones as gods. Maximian went into a rage and ordered that he be tried and imprisoned in a bath. And all the while he was imprisoned, the populace ran with mourning to hear Demetrios teach the people of Christ. A young lad, Nestor, also went every day and heard his teaching." "During those days, many brave men fought in the stadium and Maximian rejoiced at these spectacles. He even had a great honor a certain henchman Lyaeus, a beastly man, brass-knuckled, an idolator and blasphemer, brought from some barbarous nation. 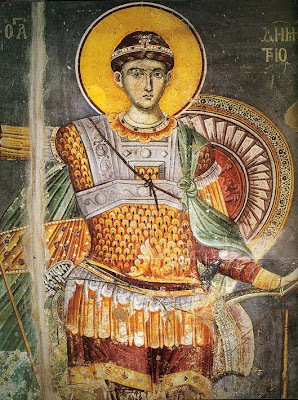 Nestor, seeing that this Lyaeus had defeated all the boasted that he had the strength of Ares, the pagan god of war, and that no native dared wrestle with him, went to the prison and besought St. Demetrios to bless him to defeat and put to shame Lyaeus and Maximian and their religion." 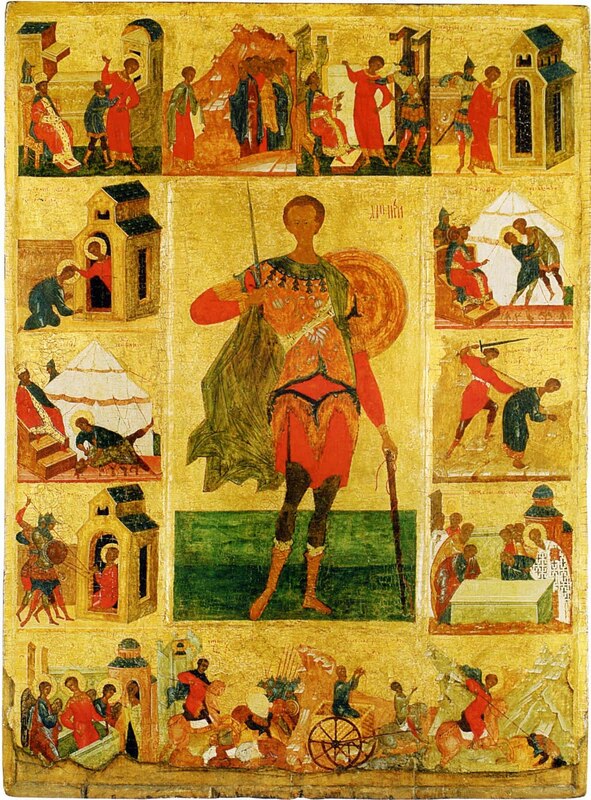 "Aghios Demetrios prayed and made the sign of the Cross over him, and immediately Nestor ran to the stadium and wrestled with that fierce giant, and he threw him down, and slew him. 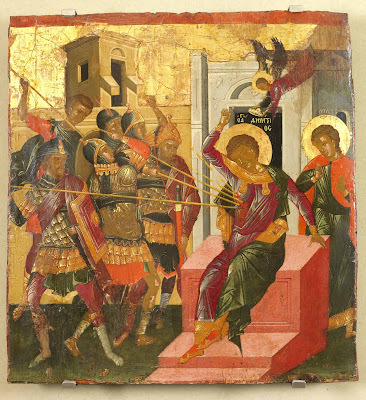 Then Maximian became beside himself with rage and learning that Nestor was a Christian and that St. Demetrios had blessed him, he ordered the soldiers to have them put to death." 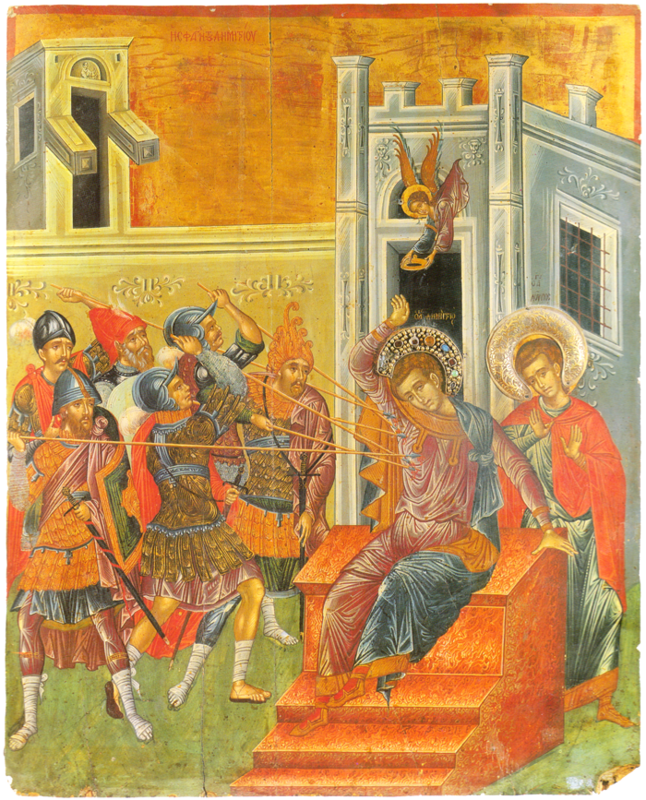 "And they going to the bath lanced St. Demetrios (note holy icon above top of the page) with their spears, and thus he received the eternal crown on the 26th of October, 296 A.D., at the age of thirty-six. It is written that when he saw the soldeirs thrusting their spears at him, he raised high his arm and they lanced him in the side, so that he might be deemed worthy to receive the lancing which Christ received in His side, and there ran blood and water from the wound. 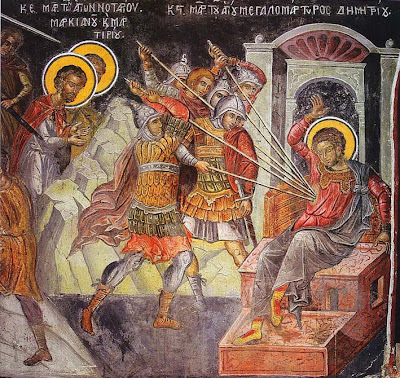 Nestor was beheaded the next day (holy Martyr Nestor of Thessalonica is commemorated in the holy Orthodox Church on the 27th of October) outside the wall at the place of the Golden Gate with his own sword." "The holy Christians took the holy remains and buried them side by side, and from the grave of St. Demetrios there came forth holy myrrh which cured many diseases. For this reason he is called Myrovletes. Over his holy grave and the place of his holy martyrdom there was built a church in the form of a basilica which stands to this day. 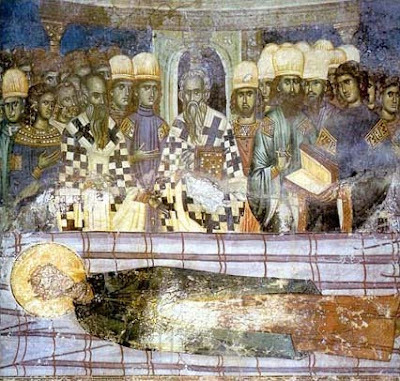 In 1143 the Emperor Manuel Comnenos sent from Constantinople and brought the holy icon of the Saint which was at his tomb and put in the Monastery of Pantocrator, whose church was build by the Comneni and is called today Zeirek." "This then is the holy martyrdom of Aghios Demetrios the Great Martyr and Myrrh-bearer, who loved our Savior above all things of this life - - pleasures, wealth, honors - - and longed to be dissolved that he might be found with Him in the celestial Kingdom, through whose prayers may we also be deemed worthy of like fate. Amen. 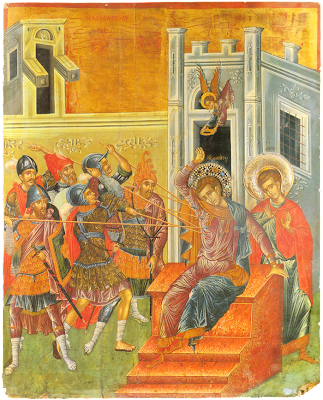 For another account of the life of St. Demetrios, see: http://ocafs.oca.org/FeastSaintsViewer.asp?SID=4&ID=1&FSID=103059. 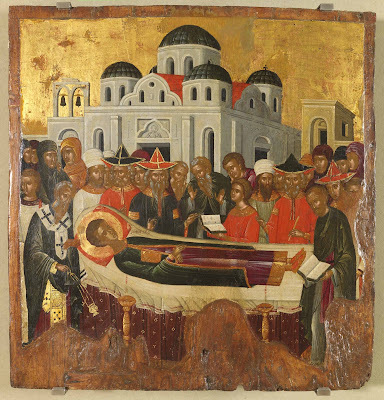 For a previous post on the Veneration of St. Demetrios and Thessaloniki, see: http://full-of-grace-and-truth.blogspot.com/2008/10/veneration-of-st-demetrios.html. 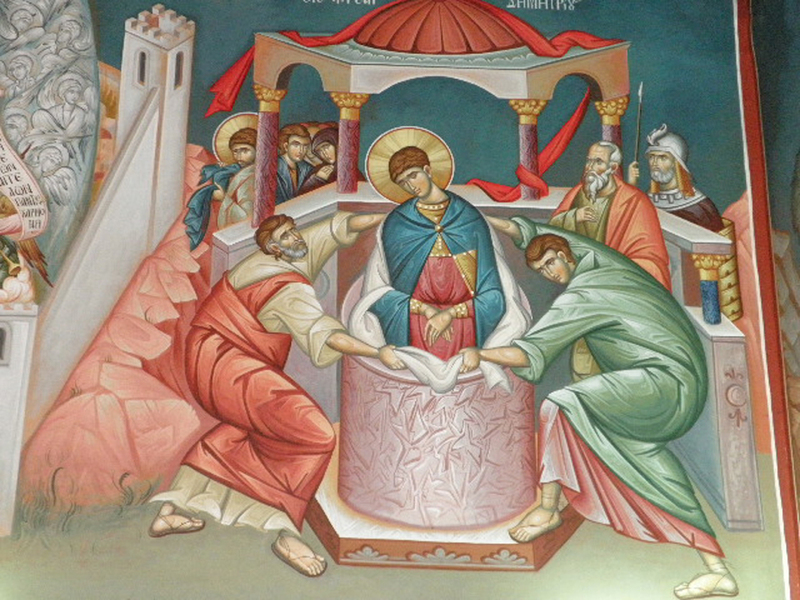 For a post with numerous miracles of St. Demetrios, see: http://full-of-grace-and-truth.blogspot.com/2009/10/miracles-of-st-demetrios-myrrh-streamer.html. Glory. Of the Saint. Tone 8. By Anatolios. Your most godlike and blameless soul, revered Demetrios, has her dwelling in the heavenly Jerusalem, whose walls have been adorned by the hands of the invisible God. While on earth this famous temple holds your all-honoured and most valiant body, an inviolate store house of treasures, a remedy for diseases; to it we have recourse and draw healings. Guard the city which magnifies you, All-praised, from assaults of foes, for you have boldness towards Christ who glorified you. Apolytikion. Tone 3. Your confession. The whole world has found you as a mighty champion in dangers, O victor, who rout the nations. Therefore as you destroyed the pride of Lyaios in the stadium by giving Nestor courage, holy great Martyr Demetrios, implore Christ God to grant us his great mercy. Excellent meritorious work. There are so very many wonderful axiomata and theologoumena here - this and the other site(s) are beautifully done! All Christians and particularly the Orthodox should visit. Let us note, however, a few more details: The Emperor Maximian confronted by Demetrios was not the Augustus Maximianus Senior of the West, who was headquartered in Rome, but rather the Caesar Galerius, a.k.a. Maximianus Junior the Tetrarch; and it was he who provoked his father-in-law, Diocletian, the Augustus of the East, to launch The Tenth Imperial Persecution in 303 AD. As for dating, there is no absolute surety for any of the Saints of Thessalonike in this period. during the 10th Persecution, not at its beginning in 303 AD under Diocletian, but after his abdication, that is, after Galerius Maximian had replaced him as Augustus of the East - thus the year 306 AD for Demetrios' martyrdom would accommodate the time frame of events more precisely. The 10th Persecution had not yet been officially enacted until 303, so the martyrdoms of Demetrios and Nestor could not have occurred in 296, but only afterward. Thus with his martyrdom in 306, Demetrios' birth year would also have to be adjusted to 270 AD, not 260, in order for him be age 36 at the time of his passing to Heaven. 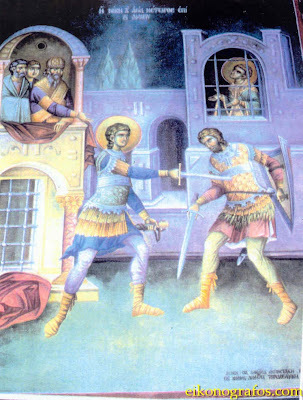 Nestor was actually martyred by beheading on the same day - before Demetrios - at the Golden Gate following the combat with Lyaios, which would have taken place in the afternoon. And most attest that after that, as the sun was beginning to set, the soldiers who were sent arrived and executed the Great Martyr Demetrios with lances. 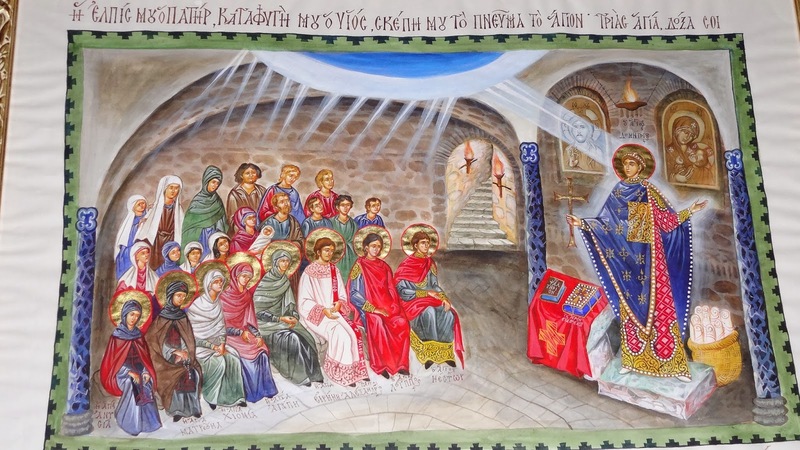 The Church, desiring to honor each Holy Martyr individually, commemorated Demetrios on the actual day of Oct. 26, but set a special commemoration for Nestor to continue with vespers into the following day of Oct. 27. Thus both are doubly united in commemoration for the two consecutive days. I am seeing a saint demetrius pendant on the internet that looks like a flower is there any information on this?